Donbass Arena sometimes referred to as just Donbas Arena is a 2009 built football stadium located in Donetsk, Ukraine. Home to FC Shakhtar Donetsk, the 52,187 capacity ground was used to host matches of the Euro 2012 championship. With Shakhtar previously playing at the 1958 built NSC Olimpiyskiy stadium which was largely uncovered and featured an athletics track around its perimeter, the club had long vowed to build a modern stadium. With the country submitted a joint bid with Poland to host Euro 2012, there was initially uncertainty as to whether nor not the construction would be contingent on the success of the bid, but the club pushed on regardless and began construction in 2006. Estimated to cost around $400M for the entire stadium complex, the 52,518 capacity ground practically doubled the capacity of the former stadium and underlined the Ukrainian club’s desire to become the largest team in the country. To achieve this, ArupSpot’s help was enlisted after the company successfully built The City of Manchester Stadium and Munich’s much loved Allianz Arena. The design is famous for resembling a flying saucer, with the roof appearing to levitate above the stands, complimented on the inside by the oval shaped curvature and modern glass façade which encourages natural sunlight to enter the pitch. 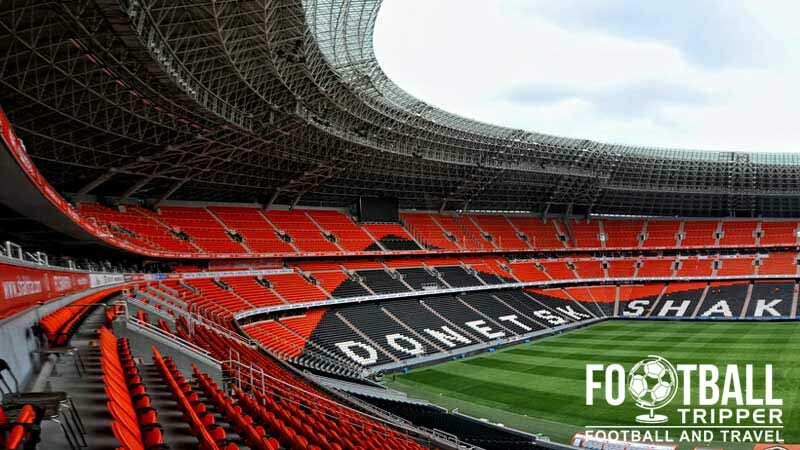 The name Donbass Arena is derived from the industrial area it is located within, known as the Donets Basin and the inaugural match was held against FC Obolon Kyiv on the 27th September 2009. During the Euro 2012 tournament, the Donbass Arena hosted three Group D matches, a quarter final and one semi-final between Portugal and eventual winners and World Champions Spain, who managed to retain their title as European Champions after winning the 2008 tournament. The final was held in Kiev’s Olympic Stadium which is home to the national football team. 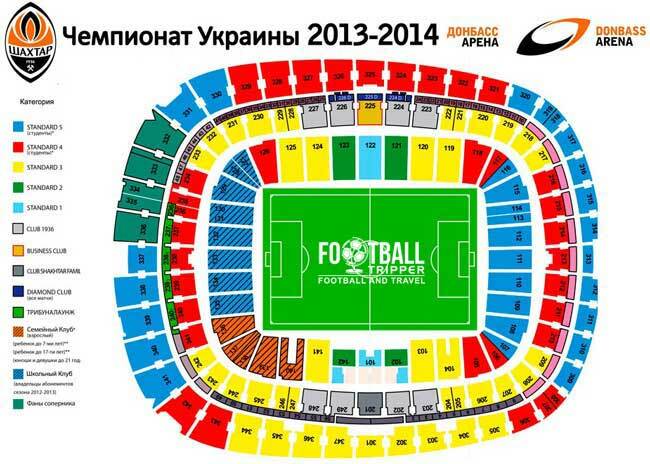 The Donbass Arena is comprised of four stands: North, East, South and West. Please note that due to ongoing conflict in Eastern Ukraine as of the 2014, Shakhtar Donetsk are currently playing their home fixtures at the Arena Lviv due to safety concerns ! A cross section of FC Shakhtar fans inside Donbass Arena. Away fans are housed within the south-west corner of the stadium within a small section of seating separated from the home fans by steel fencing. Donbass Arena is located right in the city centre within one of the most popular nightlife areas of Donetsk. There are over 53 food and beverage outlets in and around the Donbass Arena as well as the Fan Café. Located within Zone B of the south stand, the fan Café is open to the general public Monday to Sunday between 10.00 am – 8.00 pm. 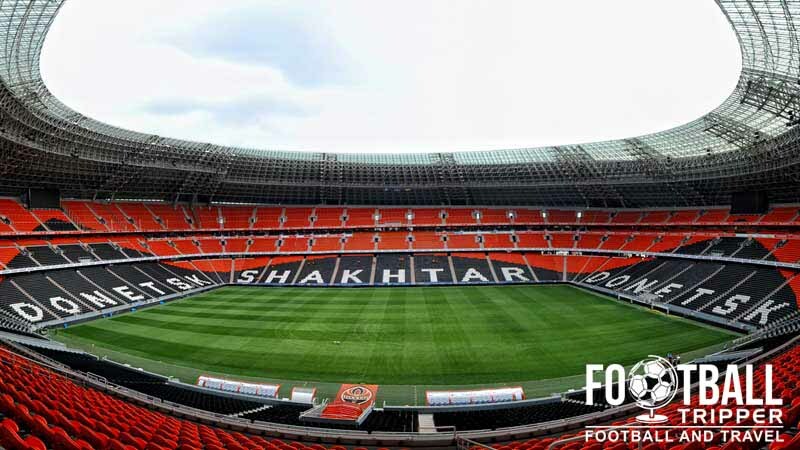 FC Shakthar Shop’s at Donbass Arena spans over 390 square metres, and with the exception of the online store, is the best place to purchase official merchandise. Matchdays: Before kick off and 1 hour after the full time whistle. FC Shakhtar Club Shop is located within the south stand but there are two other shops to be found around the city of Donetsk. 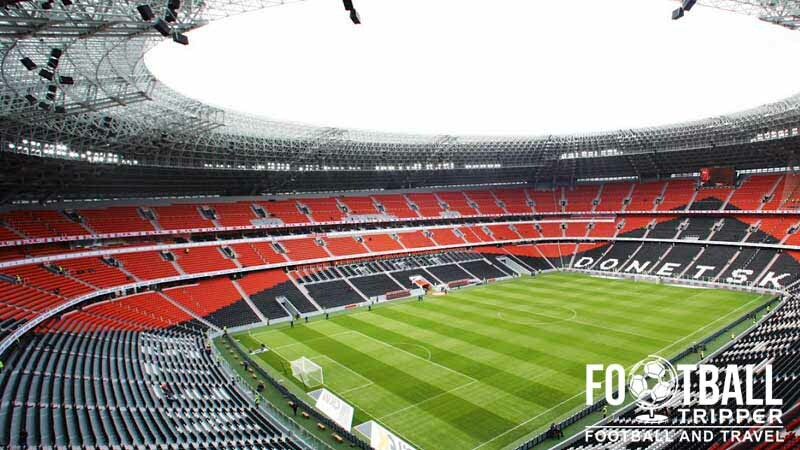 Tours of Donbass Arena are available during the week, six times a day on the hour between 11.00 am and 5.00 pm. Tickets to the stadium tours can be purchased from the reception area at FC Shakhtar Museum up to five minutes before the tour is due to the start. Tickets to see Shakhtar Donetsk play at home are available to purchase online, or in person from the box office at the stadium. For smaller domestic matches you can usually acquire tickets on the day of the match but for large European encounters you must always book in advance. Donbass Arena is located within a prime location within Lenin Comsomol Park in the city centre. Fans gathering outside Donbass arena on matchday in anticipation of Shakhtar’s home game. There are a total of five car parks at the Donbass Arena but none of them are available to the general public on matchdays. Donetsk’s main railway station sits 5.8 km northwest of Shakhtar’s stadium, and acts as the main base for the region’s railway company which ensures the city if well connected to the rest of Ukraine. You can certainly see Donbass Arena’s “spaceship” comparisons based on this picture! The stadium is served by its own tram stop known as “Donbass Arena Stadium” which sits south-west of the stadium. It forms part of tram line 6 which runs vertically through the city centre. There is also a bus stop towards the south-west of the park known as “Donbass Arena Stadium”. This is served by bus numbers 23, 70, 77, 100 and 8. Donetsk International Airport was located 10 km northwest of Donetsk city centre. Since October 2014 civilian airlines have suspended flights to the airport, and a few months later it was destroyed by rebel forces. There are numerous recognisable names within the city centre including the likes of Ramada Donetsk and Park Inn by Radisson. 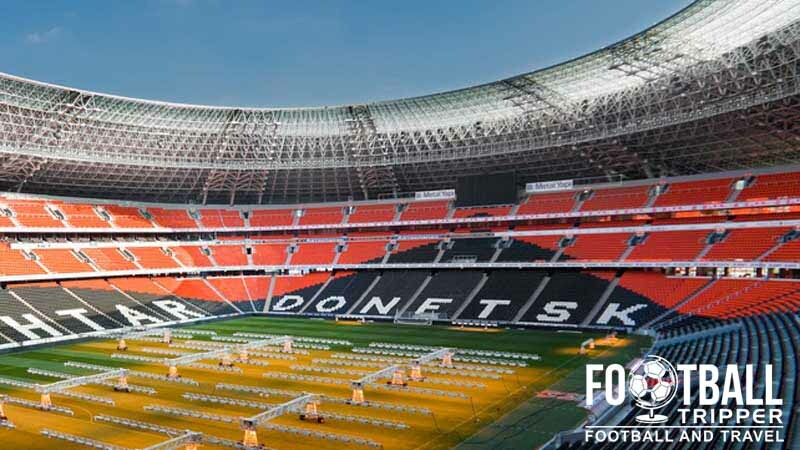 The majority of accommodation options are walkable from Donbass Arena within 15 minutes.